The Cordyceps fungus has become a fixture in popular media, at least as the go-to comparison/cause for fictional human zombies. The nominal Cordyceps that most people think of is probably Ophiocordyceps unilateralis - the infamous "zombie ant fungus". But what most people don't realise is that there isn't just "the Cordyceps fungus" - that is just a single species out of many ant-infecting fungi in the Ophiocordyceps genus. That's right - there are multiple species of zombie ant fungi and not they are all different. Each of them have evolved their own ways of getting the most out of their ant hosts. The species featured in today's blog post is Ophiocrodyceps pseudolloydii, and it is found in central Taiwan. This fungus specifically targets a tiny ant called Dolichoderus thoracicus. In the forest of central Taiwan are so-called "ant graveyards" - areas with high density of Cordyceps-infected zombie ants. Such sights are familiar to scientists who study these ant-fungi relationships, indeed, such "ant graveyards" have been found in other parts of the world where ants and Cordyceps fungi co-occur. A group of scientists set out to document the behaviour and position of ants which have been mummified by O. pseudolloydii. One key thing they observed was that no matter where the zombie ants were found in the forest, the head of the dead ant tends to be pointed towards the direction of openings in the forest canopy. This indicates that the fungus might be using sunlight that comes through the canopy as a cue to steer the host ants into position. Like other ant-infected Cordyceps fungi, O. pseudolloydii places the host ant in a position which is ideal for spreading its spores, without being dried out in open air. This usually means placing the ant underneath a leaf. But the fungus needs some way of anchoring the ant to the leaf before it can mummify the host and start sprouting into a fruiting body. Ophiocordyceps unilateralis induces a "death grip" in the zombified ants, whereby the ant locks its mandible around the vein of a leaf to secure it in place. 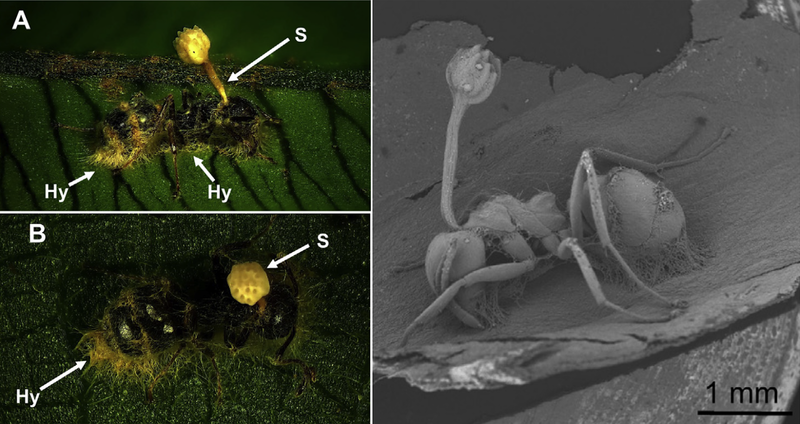 But O. pseudolloydii does not do that - instead of using the ant's mandible, O. pseudolloydii simply sprout a dense mass of fungal tissue which binds the ant to the underside of a leaf. So why doesn't it simply do what its more famous cousin does and make the ant bite down on a leaf vein? Possibly because the ant which O. pseudolloydii infects is much smaller than the carpenter ant which O. unilateralis parasitises. Compared with the carpenter ant workers which can grow up to 25 millimetres (about an inch) in length, the workers of D. thoracicus are merely 4 millimetres long. With such a tiny host a dense mat of fungal tissue is enough to anchor the ant in place. By doing so, this might allow the fungus to save on making the mind-altering chemical to induce the leaf-vein biting behaviour, which can possibly allow it to produce more spores instead. All Ophiocordyceps pseudolloydii needs to do is make sure the ant is intoxicated enough to crawl to the right spot, and once that is done, the fungus will take care of the rest. Chung, T. Y., Sun, P. F., Kuo, J. I., Lee, Y. I., Lin, C. C., & Chou, J. Y. (2017). Zombie ant heads are oriented relative to solar cues. Fungal Ecology 25: 22-28. The parasite being featured today is one of a handful of parasitic nematodes that you can purchase from your local gardening supplies store. 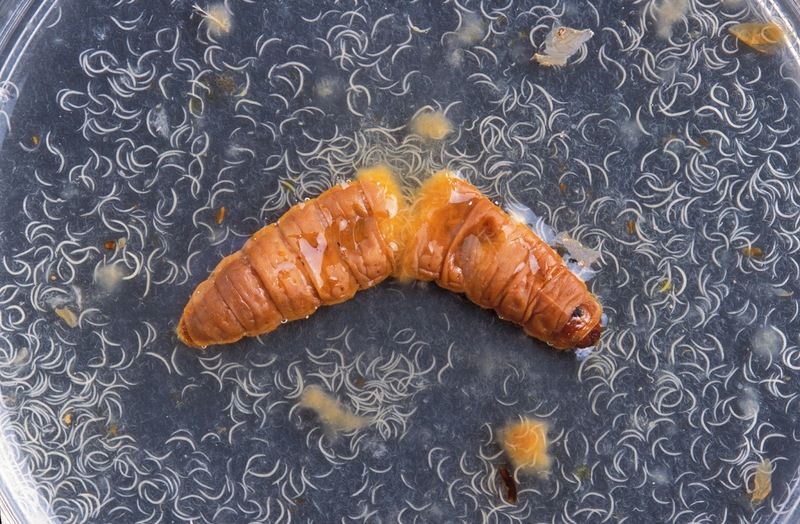 There microscopic worms, called entomopathogenic nematodes (EPN), are commonly used by both farmers and gardeners as a weapon against a range of insect pests. Most people who use such worms probably don't give much thought to how these worms kill insects - as long as they work as intended, then it is out-of-sight and out-of-mind. But it is worth mentioning how these worms actually do their killing. Technically speaking, Heterorhabditis bacteriophora itself doesn't kill the insect, the real killer is a bacterial symbiont that it carries. Bacteria from the Photorhabdus genus have co-evolved into a mutually beneficial partnership with nematodes like H. bacteriophora. When the worm infiltrates into an insect, it unleashes its deadly bacterial payload. The released Photorhabdus then proceeds to multiply rapidly, flooding the insect's system with toxins and converting its innards into a nutritious goop for the nematodes to grow in. It takes the worms about 20 days of bathing and drinking in the bug goop to complete incubation and produce the next generation of infective worms - in the mean time, they do not want to be disturbed. However, to most larger animals, an immobile insect is simply an easy meal - if a bird or another animal happens upon the worm-filled bug, they just gobble it up - and this kills both the nematodes and its bacteria. A few years ago, it was discovered that the worm-bacteria duo also change the colour of the insect in order to deter birds. About 24 to 36 hours after the insect has been killed, it starts to glow, and over the course of a week its colour changes from a tangerine orange to a bright pink red. But what about for hungry animals that don't judge prey with their eyes? They found that the beetles consistently preferred the parasite-free waxworms, in fact the beetles are more likely to stay away from waxworms which had been festering with H. bacteriophora for longer periods. To further examine if it was indeed the smell rather than colour that were deterring the hungry beetles, the researchers mashed up some of the infected waxworms, and the beetles still preferred the mashed-up parasite-free waxworms over those with nematodes and its bacterial symbiont. It seems that the H. bacteriophora-infested cadaver not only change colour, but also emits a repellent smell. But wait, isn't that just what happens with a rotting corpse? However, the odour associated with insects killed by a H. bacteriophora infection is distinctively different from decaying insects that had died through other causes. The researchers notice this themselves while raising colonies of H. bacteriophora. This is probably because while most dead insects are colonised by a variety of different microbes, those killed by these nematodes are colonised almost exclusively by Photorhabdus and its host worms. While killing the host is a good (and drastic) way of shutting down the immune system, thus leaving the parasite free to do what it wants, it also leaves it vulnerable to other predators and microbes that might make a meal of the now defenceless host. So H. bacteriophora and its symbiont have to provide it with a new type of protection. This study also provides a nice tip for any prospective zombie fiction writers - if you want some kind of science-y explanation for why your walking dead do not succumb to the multitude of organisms that would gladly feast on a human cadaver, H. bacteriophora just handed you an idea, straight from wonderful mother nature. Jones, R. S., Fenton, A., & Speed, M. P. (2016). “Parasite-induced aposematism” protects entomopathogenic nematode parasites against invertebrate enemies. Behavioral Ecology 27: 645-651.